We acquired our first Cavalier in 2001. Darla was the light of our lives and was a wonderful therapy dog for many years. We added a half sister to Darla the following year and had such fun going to the Nut Tree and Apple Hill every year with the girls. A few years later we decided we wanted a tri color and happened to find one at a COTW show in the Bay Area. Cassidy became my daughter’s show dog and she spent a year showing him and having fun. She put some points on him, but he really did not like the ring and wanted to bolt for the entrance so she finally decided to just let him stay home and play with the girls. When our Darla passed away our hearts were broken. We were very fortunate when Tad and Ellie came into our lives to help ease the pain. Though we bought them as pets, they came from very good lines and were shown to their AKC Grand Championships which brought me into the world of showing dogs which has changed my life. A special thank you to Jo Anne Mittelman and Kumar Subramanian for showing Tad to his GCH with their handlers Bill and Taffe McFadden, and for also allowing the McFaddens to help me finish Ellie as i learned to show her. Thanks to Jo Anne for being my mentor which was not always easy. 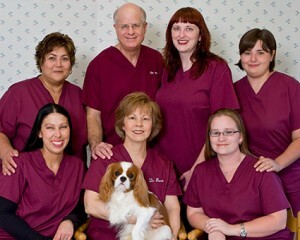 I love showing my dogs and I exhibit them in both AKC and the Cavalier King Charles Spaniel Club USA. I am also an active member of both club systems. I have finished 9 AKC Champions, 8 AKC Grand Champions and one CKCSC USA Champion most recently for my boy, Suade. I have made many good friends through my Cavaliers and we have great fun at the shows. Thank you to Suzanne and Todd McCoy and Betzie Smith for entrusting me with their lovely progeny. With their help I am becoming a successful exhibitor and breeder. It has been a wonderful journey so far. As a veterinarian I am committed to testing for patella luxation, mitral valve disease, hip dysplasia, and retinal dysplasia. I also DNA test all my dogs for dry eye/curly coat and episodic falling. I believe temperament is extremely important and that any breeding should be based on passage of all health tests after age two of sire and dam, good temperment of sire and dam, and a careful evaluation of the pedigree for any notable health problems. Structure is of utmost importance and there should be a careful evaluation of the sire and dam in order to better the structure of the progeny before breeding. My dogs are my children and have the run of the house. They are all hugged and kissed, walked, played with, and groomed everyday with loving care. They go everywhere with me. They are my pride and joy and I have so much fun with them in obedience and conformation classes. All my dogs are obedience trained and most have passed the Canine Good Citizen test. They all sleep curled up next to me on my bed. There is nothing better than going to sleep with a Cavalier on the pillow beside you.